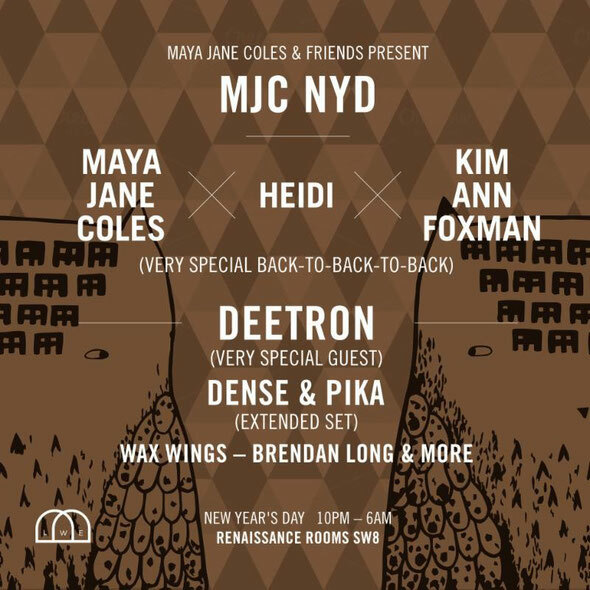 To bring in the first evening of 2015, Maya Jane Coles has lined up a very special back-to-back-to-back showcase, which will take place at The Renaissance Rooms in Vauxhall London, with three artists on the international circuit combining for the first time ever. Having all crusaded on their own separate journeys over the past few years, Maya Jane Coles, Heidi and Kim Ann Foxman will play in unison for the first time ever, bringing their individual influences and inspirations together for one night of tag-team action. On top of this, there'll be an extended set from Deetron, whose fusion of moody techno and soulful house has made him popular amongst clubbers. Also on the bill is Dense & Pika, who join in on the action with an extended set.